Group B Streptococcus (GBS) is a leading cause of neonatal sepsis and meningitis in high-income settings and is associated with high rates of neonatal mortality and morbidity. There is now increasing evidence to suggest that there is a high GBS disease burden in resource-limited countries, and it is therefore critically important to identify suitable and practical preventive strategies. In Europe and North America, intrapartum antibiotic prophylaxis (IAP) has led to a dramatic reduction of early-onset GBS disease. However, the methods for identifying pregnant women who should receive IAP and how to reduce late-onset GBS disease are not without controversy and are challenging for most sub-Saharan African countries. GBS vaccines are approaching phase III trials but are still under development. This review aims to explore the current evidence related to strategies for reducing invasive GBS disease in an African setting, the development of a GBS vaccine and whether preventative measures against GBS disease can be practically implemented. Worldwide, under-five mortality has fallen from 12.7 million in 1990 to 6.3 million in 2013.1 ,2 However, progress needs to be made to reduce mortality in the first month of life, particularly in resource-limited settings where neonatal deaths accounted for 44% of all under-five mortality in 2013.3 In Africa, the neonatal mortality rate (31 per 1000 live births) is almost 4–5 times higher than that of the Americas (8 per 1000 live births) and Europe (6 per 1000 live births).3 Bacterial infection (sepsis, meningitis, pneumonia) is a leading cause of 2.9 million global neonatal deaths worldwide.4 Implementing strategies to reduce preventable infection-related neonatal deaths by 2030 to meet the WHO Sustainable Development Goal is a global health priority. Group B Streptococcus (GBS) is a leading cause of neonatal sepsis and meningitis in high-income countries and is associated with high rates of mortality and morbidity.5 ,6 There is increasing evidence that the burden of invasive GBS disease in low–middle-income settings is underappreciated, particularly in Africa.7 ,8 Prevention of neonatal invasive GBS disease may therefore have a considerable impact on under-five mortality. The use of intrapartum antibiotic prophylaxis (IAP) has been associated with an 80% reduction in early-onset GBS disease (EOD: 0–6 days of life);9 however, GBS remains a leading cause of severe neonatal infection. The ineffectiveness of IAP in protecting against late-onset disease (LOD: 7–89 days of life), combined with a high incidence of EOD in preterm babies (1.0 per 1000 live births), is a contributing factor.9–11 The evaluation of IAP as a strategy for the prevention of EOD has largely been undertaken in high-income settings,12 ,13 and there is paucity of data on its suitability and practicality in resource-limited settings, where there are additional constraints, such as the lack of routine access to antenatal and intrapartum care, especially in rural settings. WHO predicts that the proportion of live births that occur in sub-Saharan Africa will continue to increase.3 Strategies to reduce the burden of invasive GBS disease and consequently under-five mortality in resource-limited settings is a public health priority. 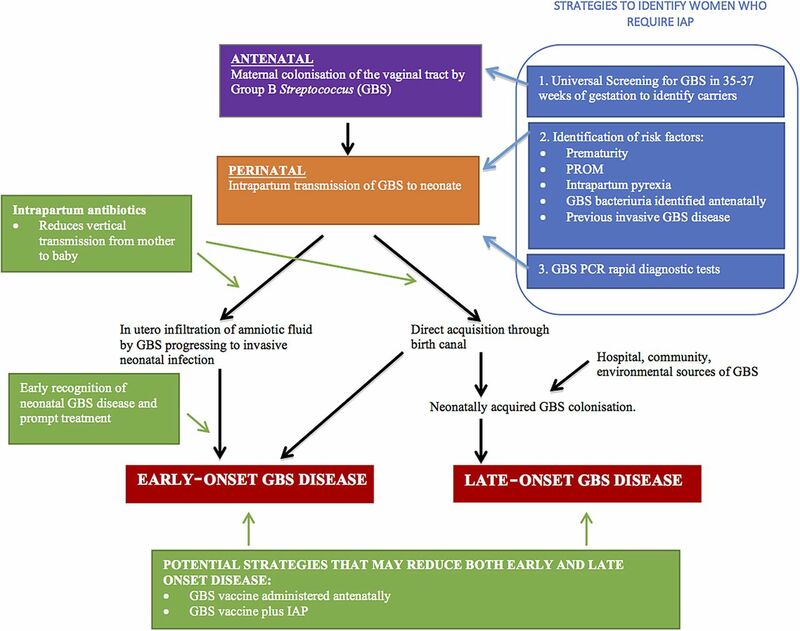 In this review, we summarise the pathogenesis of GBS colonisation and explore the current evidence related to reducing invasive GBS disease, the development of a GBS vaccine and whether preventative measures against invasive GBS disease can be put into practice in resource-limited countries. EOD occurs following acquisition of GBS by the fetus or newborn from their rectovaginally colonised mother. Though 30–70% of the newborns of GBS colonised women are themselves colonised at birth, only 1–3% go on to develop EOD.12 ,13 ,16 Infection of the fetus can occur either by invasion of amniotic fluid following prolonged rupture of membranes (PROM) or through direct acquisition during birth.10 GBS can invade through macroscopically intact membranes possibly through microtears of the amniotic sac.17 GBS β-haemolysin promotes lung epithelial cell invasion, leading to invasion into blood vessels.6 ,18 Hence, inhalation of infected amniotic fluid or genital secretions can cause bloodstream invasion, sepsis and meningitis.18 Disease progression is rapid, with 90% of EOD presenting within 24 hours of delivery, and frequently already manifest at birth.10 This, along with the failure of chlorhexidine vaginal douches during labour to reduce EOD,19 suggests that most EODs commence in utero. Two common approaches are used to identify pregnant women who should receive IAP: universal screening and a risk-based strategy. More recently, rapid diagnostic tests have been developed. Several risk factors are associated with increased risk of EOD in the newborn, including preterm labour, PROM >18 hours, intrapartum fever >38°C, GBS bacteriuria in the mothers during the current pregnancy and previous sibling with invasive GBS disease.51 Several countries adopt a strategy to implement IAP when some or all of these risks are identified. More recently, novel rapid methods to augment or replace traditional microbiological methods to identify GBS have emerged. Rapid real-time PCR tests demonstrated sensitivity from 62.5% to 100% and specificity from 84.6% to 100% compared with enriched GBS cultures.51 Di Renzo et al51 argue that this method could prove superior to risk-based approach or universal screening if undertaken when a woman is in labour as those who are current carriers of GBS are at most risk of passing GBS to their babies will be identified. Direct antigen detection tests are rapid and inexpensive, but not sufficiently sensitive for diagnosis.51 The loop-mediated isothermal amplification method to identify GBS could combine many of the advantages of PCR tests with the relative simplicity of antigen detection tests;54 however, this is still in development. In resource-limited settings, these tests at present may prove too expensive and logistically challenging as an alternative strategy in high-volume settings. Administration of IAP does not eradicate the risk of early-onset GBS disease. Furthermore, delay in administering IAP due to factors such as late presentation to the labour ward, rapid delivery or misidentification of risk factors/maternal GBS colonisation status can result in inadequate IAP cover. Early recognition of the signs of neonatal sepsis and commencing treatment promptly are crucial in preventing rapid invasive GBS disease progression. Further studies are needed in LMIC settings. A randomised controlled trial to evaluate outpatient prenatal oral amoxicillin versus placebo did not significantly impact on GBS vaginal colonisation at the time of delivery (p=0.20).55 Few studies have evaluated the pharmacokinetics or effectiveness of IAP delivered by alternative routes, such as orally or intramuscularly. There could be a more feasible way to deliver intrapartum antibiotics to at-risk women in labour outside of a tertiary hospital setting in resource-limited countries and require further evaluation. Can GBS preventative measures be put into practice in a resource-limited setting? The most promising strategy in reducing neonatal invasive GBS disease is maternal vaccination; first, it has the potential to prevent both EOD and LOD; second, it could be made to be cost-effective; and third, it may reduce GBS-related stillbirths and premature delivery. However, the vaccine is still in development, and it may be 10–15 years before it can be introduced into routine care. Meanwhile, strategies to identify at-risk pregnant women and to implement IAP in resource-limited settings need to be explored (table 1). The first step would be to consider either a universal screening or a risk-based approach. Both strategies ultimately rely on the dependable availability of intravenous antibiotics and adequately trained medical staff. IAP may be possible to implement in a tertiary or district hospital setting, but will prove very difficult at a primary healthcare setting, where diagnostic and treatment facilities are limited, or in areas of high rates of home births. These limitations may result in a less dramatic reduction in EOD compared with high-income countries. The advantage of universal screening at 35–37 weeks gestation is that it could identify those women with the highest risk of invasive GBS disease, (ie, GBS colonisation near time of delivery) and allow targeted treatment of GBS carriers with IAP. However, there are logistical difficulties in implementing this strategy in the resource-limited setting where antenatal care and laboratory facilities may be sparse or lacking. Accurately targeting women at 35–37 weeks gestation is a challenge where routine antenatal gestation calculation by ultrasound is not available. The transport, storage and processing of numerous specimens, and communication of results to the pregnant women or health professionals may be problematic. On the other hand, a risk-based approach avoids mass screening, is cheaper to implement and could potentially achieve similar reductions in EOD compared with universal screening. Decision to treat can be made on admission, and therefore, laboratory support is not required. However, this approach potentially overlooks the main risk factor for EOD, which is maternal GBS colonisation/bacteriuria. Up to 50% of women with risk factors are not colonised with GBS,10 leading to unnecessary administration of antibiotics, while women with no risk factors in labour can still have babies with GBS disease. Intrapartum GBS screening with rapid real-time PCR testing was recommended by the Consensus Conference on GBS in Europe in 2014.51 However, the cost to implement and requirements for appropriate reagent storage and supply would make this a less attractive and practical alternative in the resource-poor setting. A simple, cheap point-of-care test could improve the timely implementation of IAP (figure 1). Pathogenesis of neonatal group B Streptococcus (GBS) disease and target for intervention. IAP, intrapartum antibiotic prophylaxis; PROM, prolonged rupture of membrane. A possible variation to the use of IAP is to revisit the efficacy of maternal intramuscular and high-dose oral antibiotics in labour, which potentially circumvents the problem of delivering intravenous antibiotics in primary healthcare or home settings. The pharmacokinetics and drug concentration in utero need to be further evaluated, and ultimately, if promising, these need to be tested in controlled trials. The development of measures to reduce the infectious causes of neonatal mortality is critical, and supportive evidence is urgently needed. Although vaccine development appears to be the most feasible and cost-effective strategy to achieve long-term solution, this may take several years to come to fruition. Clinicians need to be able to recognise the early signs of neonatal sepsis and start the appropriate treatment promptly. Novel, affordable alternative approaches to prevention should be explored in parallel. Pharmacokinetics and pharmacodynamics in utero of high-dose oral intramuscular antibiotics could be revisited. Finally, critical barriers need to be addressed in selecting which prevention strategy is most suitable for the target population and cost-effectiveness evaluated to reflect the available healthcare infrastructure. Once introduced into policy, it will be essential that the appropriate surveillance is in place to monitor uptake, and impact on neonatal mortality and antimicrobial resistance. The United Nations Inter-agency Group for Child Mortality Estimation (UN IGME). Levels & trends in child mortality: report 2014. New York: UNICEF, 2014. World Health Organization Global Health Observatory. Under-five mortality, 2014. http://www.who.int/gho/child_health/mortality/mortality_under_five_text/en/ (accessed 12 Dec 2014).
. Early onset neonatal sepsis: the burden of group B Streptococcal and E. coli disease continues. Pediatrics 2011;127:817–26. , Division of Bacterial Diseases, National Center for Immunization and Respiratory Diseases, Centres for Disease Control and Prevention (CDC). Prevention of perinatal group B Streptococcal disease—revised guidelines from CDC. MMWR Recomm Rep 2010;59:1–36. Royal College of Obstetricians and Gynaecologists. Green-top Guidelines No. 36, 2nd edn. The Prevention of Early-onset Neonatal Group B Streptococcal Disease. 2nd edn, 2012. https://www.rcog.org.uk/globalassets/documents/guidelines/gtg_36.pdf (accessed 5th July 2016).
. Perinatal group B streptococcal infections across intact amniotic membranes. J Reprod Med 1988;33:445–9.
. Prevention of neonatal group B streptococcal disease: intrapartum detection and chemoprophylaxis of heavily colonized parturients. Obstet Gynecol 1989;73:583–7. Centres for Disease Control and Prevention. Active Bacterial Core Surveillance Report, Emerging Infections Program Network, Group B Streptococcus, 2014. http://www.cdc.gov/abcs/reports-findings/survreports/gbs14.pdf (accessed 26 Aug 2016). Contributors YN conceptualised and designed the article, and drafted the initial manuscript. ZD reviewed, referenced and revised the manuscript. NF, SM and RH all equally contributed to critically reviewing the manuscript. All authors approve the final manuscript as submitted and agree to be accountable for all aspects of the work. Competing interests NF is in receipt of investigator-led research grants from GlaxoSmithKline. NF and RH received funding from Novartis to conduct a trial of a GBS conjugate vaccine. SAM's institution receives grant funding for work on group B streptococcus disease from Novartis and the Bill & Melinda Gates Foundation.